More than 100 parents, carers and professionals attended an information evening last night aimed at educating them around the risks of child criminal exploitation (CCE). Presentations from Bedfordshire Police school liaison officer Richard Denton and specialist training providers CYP First focussed on the dangers and techniques of county lines gangs. There was also an opportunity for guests to ask questions of an expert panel of frontline agencies involved in combatting the exploitation of children and young people. The event was organised by local education provider The Seeds of Change, and featured contributions from modern slavery charity Unseen, child sexual exploitation charity Link to Change and Central Bedfordshire Council, on behalf of the county’s three local authorities. The event at Wootton Lower School heard about the extreme violence and grooming techniques used by criminal gangs involved in county lines, who target children to deal drugs across the country. There was also guidance on the threats that children face from being groomed online and how parents can respond to these challenges. Lisa Robinson, Bedfordshire’s child sexual exploitation coordinator, who helped organise last night’s event, said: “I was delighted to see so many people make the effort to come on a Thursday night. “This shows the level of concern there is in our communities and the desire out there to stop our children falling victim to this criminal exploitation and serious violence. “We have made great progress in terms of raising awareness and spotting the dangers around child sexual exploitation. Helen Matthews, a director at CYP First, said: “Tackling youth violence and gang culture in our country cannot be done by police and other organisations alone. “We must ensure that parents and communities are equipped with the information and knowledge of this abhorrent grooming process, to arm them in the safeguarding of not just their children, but the children in their communities. 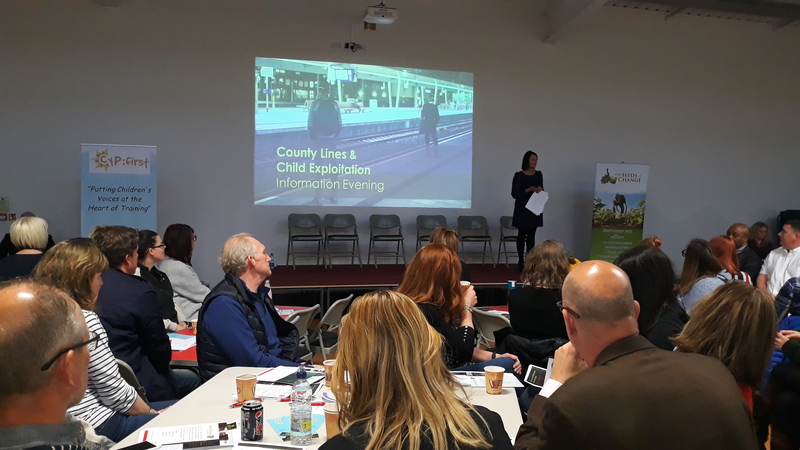 “County lines and the grooming of children for this is so widespread and last night was a true testimony to such an invested area with parents, community members and professionals all coming together to learn more about how they can safeguard children. The event raised £780 for Link to Change, an independent charity which works with children and young people at risk of sexual abuse and other forms of criminal exploitation. Rachael Frossell, a director at The Seeds of Change, said: “As a business professional who attended the Beds CSE Event in December last year, I found the event to be really enlightening from a business perspective, but essential as a parent. “CYP First identified so many behaviours in teenagers that I had observed in my own son, but the CYP presentation highlighted to me what a close link there is between normal teenage behaviour and violent gang crime and exploitation. These activities are not isolated to inner city areas, they are here, right now, in our communities; the same communities that our children have access too. “I decided that we needed to act, to do something to raise awareness in our communities, not just amongst professionals. Lisa, Richard and CYP were all on board with the idea immediately and between us we were able to arrange and put on last night’s event. Following on from the success and positive response to Thursday’s event, similar events are now being planned, which will be announced in due course.